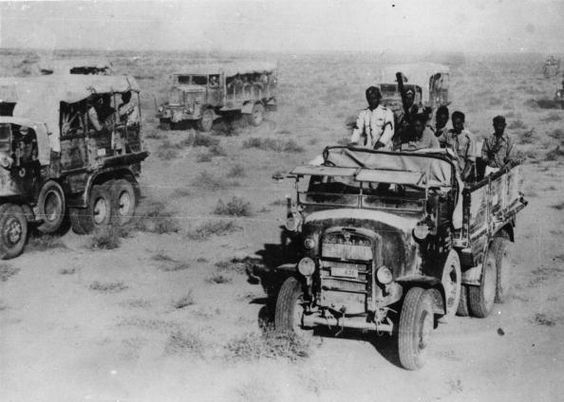 Italians on the run in Egypt, 14 December 1940. Battle of the Mediterranean: The British pursuit of the fleeing Italian soldiers forced out of their encampments outside Sidi Barrani continues on 14 December 1940. Operation Compass now has accomplished far more than was ever planned. The British 7th Support Group and the 4th and 7th Armoured Brigades sweep south through the desert, circling around Sollum and Halfaya Pass while disregarding Italian outposts further to the south. The 4th Armoured Brigade is across the Libyan border, about 20 miles west of Bardia. So far, the Italians are staying put in their Libyan encampments, which they have had for decades. The Royal Navy is heavily engaged in transporting the numerous Italian prisoners taken at Sidi Barrani to Alexandria. Armed boarding ship HMS Fiona arrives in Alexandria with 1600 prisoners, HMS Farouk takes 200, and HMS Fawzia transports 1300. This barely makes a dent in the total number of POWs, so all three immediately turn around and return to Mersa Matruh for more. Royal Navy destroyers HMS Hereward and Hyperion, conducting a sweep off the Libyan coast with destroyers Diamond and Mohawk, spot Italian submarine Naiade on the surface off Bardia. They shell the submarine, sinking it. There are 25 survivors who are taken prisoner. The air war takes another decided turn against the Italians. RAF No. 274 Squadron Hurricanes clearly outmatch the Italian biplane CR 42 fighters, while the lumbering Italian bombers also are easy prey. The Hurricanes shoot down six Savoia Marchetti SM. 79 Sparviero bombers and five CR 42s during the day. The RAF bombs Naples, damaging Italian cruiser Pola. The Italians once again divide up their fleet there as a result, sending some to Maddalena and others to Cagliari. This is part of repeated comings-and-goings of Italian warships from various ports as they twist and turn to evade RAF attacks. On Malta, Royal Navy Swordfish take off and bomb Tripoli. RAF No. 148 Squadron forms at Luqa Airfield with Wellington Mk IC bombers, the first bomber squadron actually based on the island. Italian/Greek Campaign: The Greek offensive continues grinding forward, though it is confronting both the Italians and the elements. The Greek 3rd Infantry Division consolidates its hold on Porto Palermo, which it captured on the 13th. The Italian defense is stiffening the closer the Greeks get to the key port of Himara. The RAF raids Valona. Greek III Corps, facing blizzards in the mountains, suspends operations. European Air Operations: RAF Bomber Command braves continued bad weather during the night to attack enemy shipping near Wilhelmshaven. However, no results are achieved in part due to poor visibility, and the Luftwaffe shoots down five Wellingtons. Coastal Command attacks Brest and Lorient. The Luftwaffe is quiet today due to the weather. 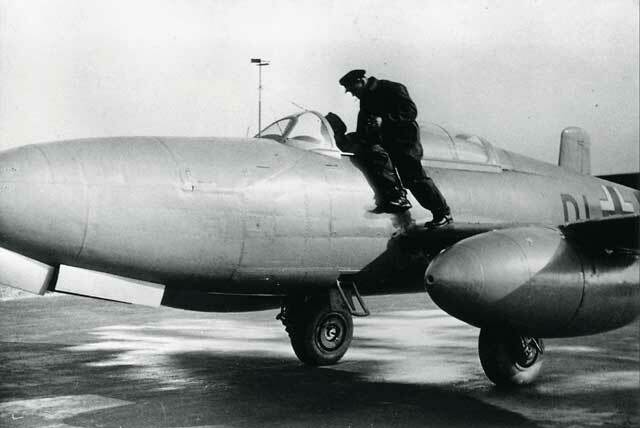 The Italian Corpo Aereo Italiano (CAI) sends 11 bombers against its usual target, Harwich. 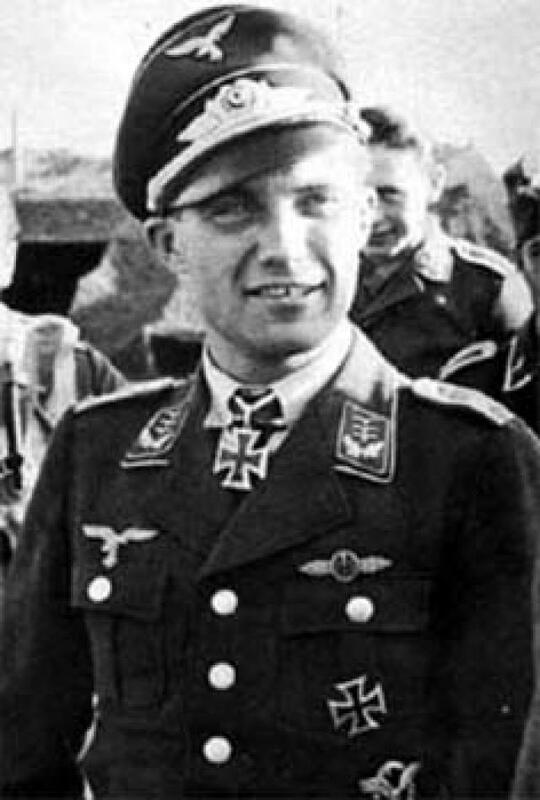 German fighter pilot Franz von Werra is awarded the Knight's Cross (Ritterkreuz) for exemplary bravery as Oberleutnant Adjutant of II./Jagdgeschwader 3. Von Werra is a major Nazi propaganda hero who is famous for his pet lion cub. Hauptmann Franz Xaver Baron von Werra sporting his Knight's Cross. Battle of the Atlantic: Poor weather continues to wreak as much havoc on British shipping as the Kriegsmarine and Luftwaffe. Two French torpedo boats in the service of the Royal Navy founder in poor weather - La Melpomene east of the Lizard, and Branlebas near the Eddystone Rocks south of Portsmouth. There are only three survivors of the Branlebas and at least five deaths. U-96 (Kplt. Heinrich Lehmann-Willenbrock) continues its very successful first patrol. Today it puts two torpedoes into 10,926 ton British liner Western Prince and sinks it about 740 km west of the Orkneys. There are 14-15 deaths and about 144 survivors, including 50 survivors among the 61 passengers who are rescued by HMS Active. U-96 at 21:02 spots 5118 ton British freighter Empire Razorbill, a straggler from Convoy OB 257, and for some reason conducts a surface attack, perhaps because it is running low on torpedoes. The U-boat scores three hits on the freighter, but the weather is horrendous and the Empire Razorbill escapes into the night. U-100 (Kptlt. Joachim Schepke) is operating southwest of Rockall when it torpedoes and sinks 3670 ton British freighter Kyleglen. There are no survivors of the 36-man crew in the rough seas. U-100 then torpedoes and sinks 3380 ton British freighter Euphorbia. There are no survivors from the 36-man crew of this victim, either. During the night, Royal Navy submarine HMS Thunderbolt - the former HMS Thetis which was raised from the mud of Liverpool Bay, sights Italian submarine Capitano Raffaele Tarantini outside of its base near Bordeaux and sinks it. Admiral Scheer resupplies from SS Nordmark in the South Atlantic. The Germans are beginning to assemble a force in the region - aside from the Admiral Scheer, cruiser Admiral Hipper and U-65 are not far off. The British do not know any of these German ships' whereabouts, but they know something is going on. The Admiralty sends Force H from Gibraltar, led by aircraft carrier HMS Ark Royal and battlecruiser HMS Renown, to patrol around the Azores. German ships occasionally have been spotted in the vicinity, and the British believe is is on Hitler's invasion list. Battleship HMS Ramillies and aircraft carriers HMS Furious and Argus, no longer really needed in the Mediterranean for the time being, arrive in the Clyde during the afternoon. The Ramillies needs a refitting, which it will receive in Plymouth. Destroyer HMS Bradford sustains damage to its propellers along the way and must be taken in tow. German freighter Rio Grande completes a very risky journey from Brazil to Occupied France. It carries 300 prisoners taken by German raider Thor in the South Atlantic and recently transferred for passage to POW camps. Convoy OB 259 departs from Liverpool, Convoy FN 359 departs from Southend, Convoy FS 361 departs from Methil, Convoy HX 96 departs from Halifax. U-71 (Kapitänleutnant Walter Flachsenberg) is commissioned. U-151 and U-152 are launched, and U-254 is laid down. Royal Navy destroyer HMS Blencathra is commissioned. Royal Navy corvette HMS Burdock and destroyer HMS Lamerton are launched. Canadian minesweeper HMCS Quinte and corvette HMS Timmins are laid down in Esquimalt, British Columbia. US Navy aircraft carrier USS Hornet is launched. 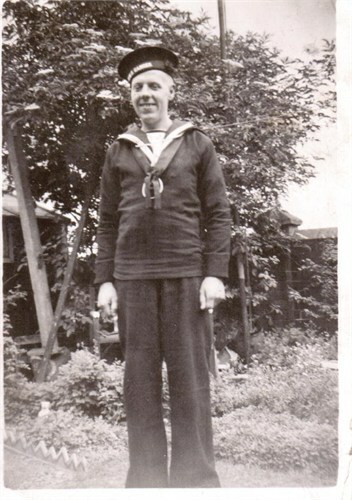 Percy Arnold Turton, aged 21, perished on 14 December 1940 on the Branlebas. He is listed on the Portsmouth Naval Memorial. Always good to remember that these are people we are talking about ... not numbers. Battle of the Indian Ocean: The Atlantis, having split up from its companion raiders Pinguin and Orion after all three refueled from the captured tanker Storstad, arrives at the remote Kerguelen Island. A heavily armed landing party finds the only town on the island, Port Couvreux, uninhabited. The crew suffers a scare when the ship grounds in one of the poorly charted bays. It hits a rock which pierces its outer hull. The shp remains stuck on the rock for three days, but eventually pulls free. The Pinguin, meanwhile, headed for the whaling fleet south of Bouvet Island, the Komet headed back toward Nauru, and the Storstad set sail back to Europe with numerous prisoners. The crew of the Atlantis sets to work performing maintenance on the ship, stocking up with water, and taking a break from constant patrols. At some point during this break, crewman Bernhard Herrmann falls while painting the funnel and perishes. His grave on the island is grandly referred to as the southernmost German military cemetery. It is the ship's first casualty during its phenomenally successful cruise. The ship will stay on the island, where it is summertime, into the new year. Battle of the Pacific: British 1896 ton coaster Cardross collides with British freighter Fiona off Sydney and sinks. 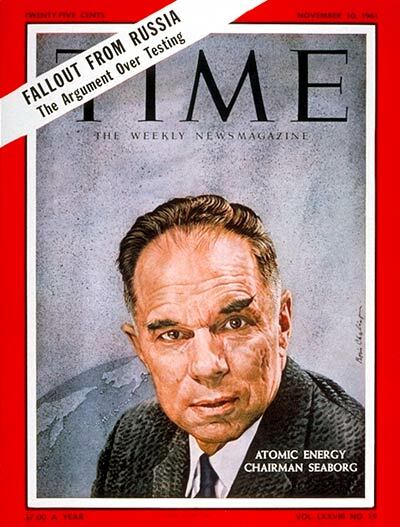 Glenn Seaborg on a 1961 cover of Time Magazine. Applied Science: Glenn Seaborg and his team discover plutonium in Room 307 of Gilman Hall at the University of California, Berkeley. The team quickly begins developing a process to create plutonium-239 by bombarding uranium with deuterons. This discovery will be used by the Manhattan Project as it works toward toward the atomic bomb. Terrorism: At Curragh Camp outside Dublin, Irish Republican Army (IRA) detainees revolt against their guards (Garda) and troops called in to quell the violence. They set fire to the camp (which they call "Tin Town" (Baile an Stáin) and clash with British soldiers. There are four casualties. The unrest continues through the night into the next day. The Éamon de Valera has imprisoned these IRA members for the duration of "The Emergency," as the war is called. Some 2000 men pass through the camp during the war. The camp's mere existence, incidentally, is proof positive that the Irish government is in some small ways acting to support the British, though not nearly enough to satisfy Winston Churchill. Vichy French Government: Vichy French Premier Marshal Petain, having ordered Pierre Laval arrested on the previous evening after having deviously obtained and accepted his resignation, announces that Laval is now no longer a part of the government. Pierre Étienne Flandin is his replacement as Foreign Minister. Laval is kept under house arrest only briefly, then allowed freedom of movement. This will remain the status quo until 1942. Petain sends a message to Roosevelt reassuring him that the French fleet will not fall into German hands. Laval is the prime architect behind French collaboration with Nazi Germany, though that is not yet blatantly obvious. Removing Laval appears to be Petain's way of making a statement about where his own sympathies truly lie. Declining the invitation from Hitler and cabling Roosevelt simply reinforces the impression that Petain feels that his country was getting a little too cozy with Hitler's Germany. Laval finds support from the German ambassador, though he is not restored to his previous powerful position as Petain's Vice-Premier. British Military: General Richard McCreery becomes commander of British 8th Armored Division. US Military: The US Army Air Corp increases its order for Boeing XB-29 bomber prototypes from two to three planes. Consolidated, meanwhile continues to work up its own quite similar heavy bomber, the Model 33, so that the US is not reliant on just the Boeing project. The XB-29 has numerous issues, including finicky Wright R-3350 Duplex-Cyclone radial engines, but overall it is a groundbreaking airframe. It eventually becomes the B-29. Yugoslavia: Former Prime Minister Anton Korošec passes away in Belgrade. Korošec was a fierce anti-Semite who introduced two laws limiting the rights of Jews, specifically barring them from the wholesale food industry and limiting the percentage of Jewish students in higher education, just a couple of months before his death. The laws only passed because Korošec warned that failure to do so would provoke Hitler. American Homefront: Winston Churchill arranges a private screening of Charlie Chaplin's "The Great Dictator," which opened in Britain on the 11th. British reaction to the film is decidedly mixed, as the climax of the film - a rambling speech by Chaplin's character posing as the dictator about understanding people and so forth - comes off as a bit late in the game considering the devastation of the Blitz. 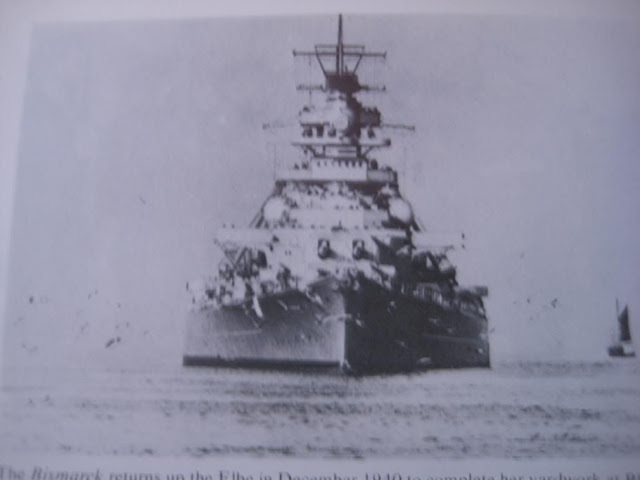 German battleship Bismarck on the Elbe, December 1940.